Everyone loves their cherished family traditions, especially for the holidays. For my family, no holiday would ever be complete without tortellini in broth (tortellini in brodo). We serve this soup the authentic way from northern Italy, specifically the provence of Emilia-Romagna. Although tortellini is delightful served in a cream sauce, this is the true northern Italian way to serve it. My family savors this delicate homemade stuffed pasta in a very American way that differs from how it is served in Italy . . . we fill our bowls with a large quantity of tortellini, whereas in Italy only a small amount of tortelllini float in a large amount of broth. Why keep going back for seconds when it’s already in front of you in your bowl? Makes sense to me! We are spending Thanksgiving in a much different way than in the past. For the first time we are celebrating this holiday on the coast on Hilton Head Island, SC. The weather is just gorgeous in the 70’s to low 80’s, with soft breezes and cool evenings. It really is a wonderful change. Each day we’ve been biking and walking the beach. A perfect way to relax, restore, and ponder on all things that we are grateful for. I found this following bit of Italian food trivia on the Barilla web-site: “Although tortellini are undoubtedly a food from Emilia, the origin of this famous pasta dish is unclear. One thing is for sure and that is that tortellini are fairly ancient. There is a recipe for tortelli, larger tortellini, that dates back to the 12th century, while the first recipe for tortellini alla Bolognese comes from 1550. From that moment on, tortellini have held a special place in the cuisine of Bologna. “Although tortellini are undoubtedly a food from Emilia, the origin of this famous pasta dish is unclear. One thing is for sure and that is that tortellini are fairly ancient. There is a recipe for tortelli, larger tortellini, that dates back to the 12th century, while the first recipe for tortellini alla Bolognese comes from 1550. From that moment on, tortellini have held a special place in the cuisine of Bologna. According to the legend, in the morning, Bacchus and Mars woke up early to visit the battle site, but when Venus awoke, she thought she had been abandoned by her companions. She immediately called the innkeeper to find out where they had gone. The innkeeper arrived to find the goddess of love naked in front of him. The beauty of her body made such a strong impression on him that he created a new shape of pasta that resembled her belly button! 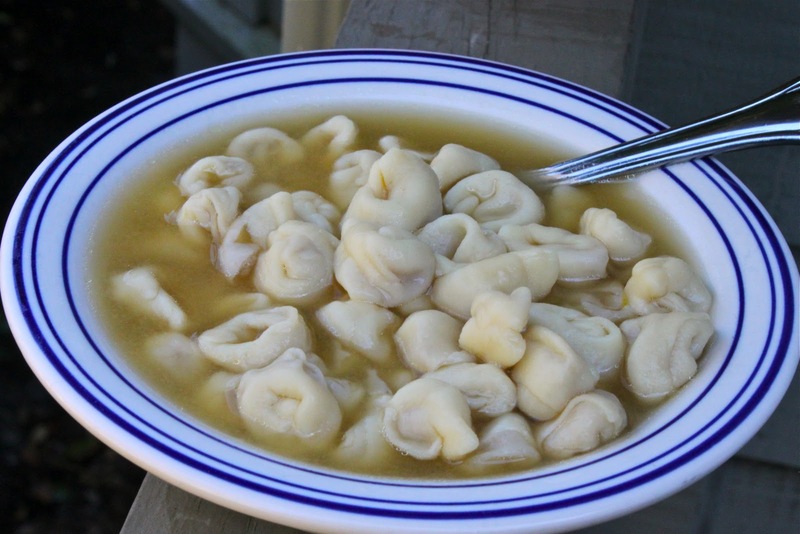 Below, there are three (3) recipes to prepare Tortellini in Brodo: one for the pasta dough, one for the tortellini filling, and one for the chicken broth (brodo). 3. Lastly prepare the pasta dough that you need fresh to fill and twist the tortellini. Once twisted into shape, the tortellini can be refrigerated for a day or two after they have laid out to dry or they can be frozen. Of course, you can always use them immediately after making them! The second time since 1983 that I made tortellini all by myself without my mother who passed in 2015. I hope that she is proud of how she taught me to make tortellini for so many years. No, the tortellini is not being baked. I put them in an OPEN door oven to keep them safe while they dry, up and away from hungry dogs who love tortellini! It works! After drying, I place them in freezer containers to freeze until the day of preparing the festive dinner on Easter, Thanksgiving, and Christmas. Blend these six ingredients together very, very well. You can mix this the old-fashioned way by making a “bowl” of flour on a wooden block, placing the wet ingredients in the center of the ‘flour bowl’ and gently add the flour in with a fork until completely mixed, OR you can mix the dough in a food processor until it has the consistency of corn meal. This finished dough should be well blended, but NOT sticky. If it is sticky, cut the dough into 3 sections and add 1 Tbsp. flour to each. If, on the other hand, it is too dry and crumbly, add 1 – 2 tsp. water. Knead the pasta dough for 2 – 3 minutes. Put into plastic bag and let rest for 30 minutes. For every egg that you use, it will make about 100 tortellini, therefore this recipe makes 100 tortellini (at the correct size that is). If you enjoyed this recipe, please pin it on Pinterest and / or share it on Instagram! Many thanks! While the veal is cooking, grind the prosciutto and mortadella in a food processor, only until it is in little pieces — don’t process to much or it will turn into a mushy mess. Then add this the cooked veal; let it cool a little or the egg that you are about to add will cook and you don’t want the eggs to cook. You need to taste throughout the blending process to determine the ‘crumbly texture and biting taste’. Get the chicken broth going on the stove before you get started rolling the pasta dough out. Fill a large, tall pot with clean water (I like to use water from my frig that purifies it) with enough room from the top of the pot to put the rest of the ingredients in without overflowing the water. Cook 2 – 3 hours. Take all ingredients out of the broth with a hand strainer. With thin tea towels covering a colander/strainer, pour the broth through them into another pot……this is a lot of work and usually needs two people to do this. Be careful, the broth is very hot while you do this. Continue to strain the broth into clean tea towels about two more times until the broth is completely clear and free of any ingredient remains. Taste, add salt to taste. I want it the American way too…filled to the top of the bowl! This sounds very good Roz and it’s easy to see why the older generations didn’t have much leisure time. Some day we must make pasta and will save this. Enjoy your beach time – we’re still in San Marcos, Tx. I hope you are enjoying your Thanksgiving break at the coast. I love the way you set this dish up to photograph. Guess what I have started a separate blog to share more of my photography, I hope you will be interested. I adore homemade soups. I’ve recently taken a class on making pasta, and making my own tortellini is the next step I want to take. Such a lovely post, Roz. Hilton Head is breathtaking and the perfect place to relax! I love this dish. My grandma used to make it from scratch also. I don’t recall seeing the round roast in the lineup. In fact, thinking more about it, her broth was more chicken than anything. Now the tortellini, well they sound exactly the same. My heart stops when I see this dish. I was on a mission in Bologna to find this everywhere and consume it in copious quantities. You have the perfect broth – deep, rich, soul-satisfying. Thank you Claudia, what an absolutely wonderful compliment! I haven’t had this dish in years and look forward to making this. 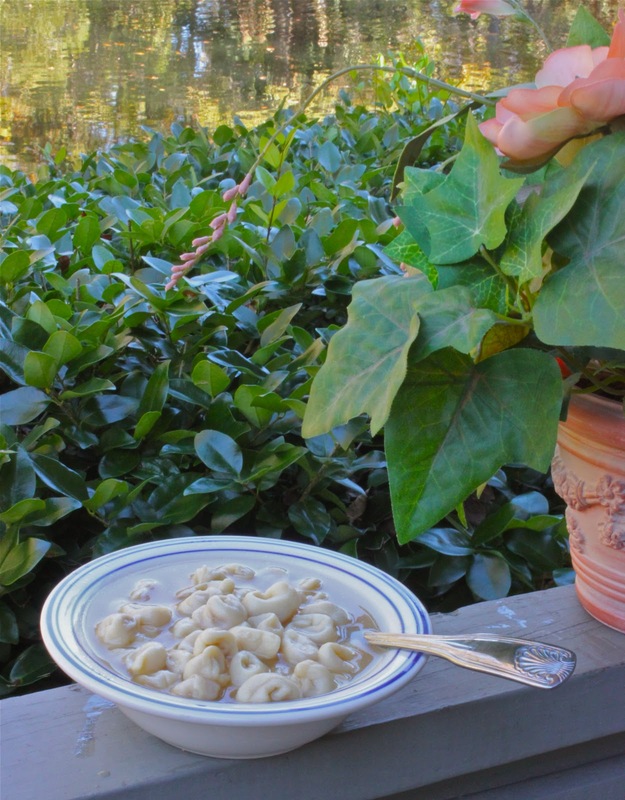 One thing…what size diameter cutter did you use for the pasta in order to get approx 100 tortellini? Chris, I don’t use any cutters, I simply use a knife to cut the pasta. You should be able to get 100 tortellini from one batch of pasta dough. Thank you for sharing this wonderful such a wonderful and traditional recipe with all of us. You’re so welcome; it is my pleasure! What an excellent question and WOW, what a great class presentation! The broth needs to be hot, not warm. If your tortellini are fresh, the time to cook in the hot broth will be minimal. If frozen, it will take longer. Now, how much time? 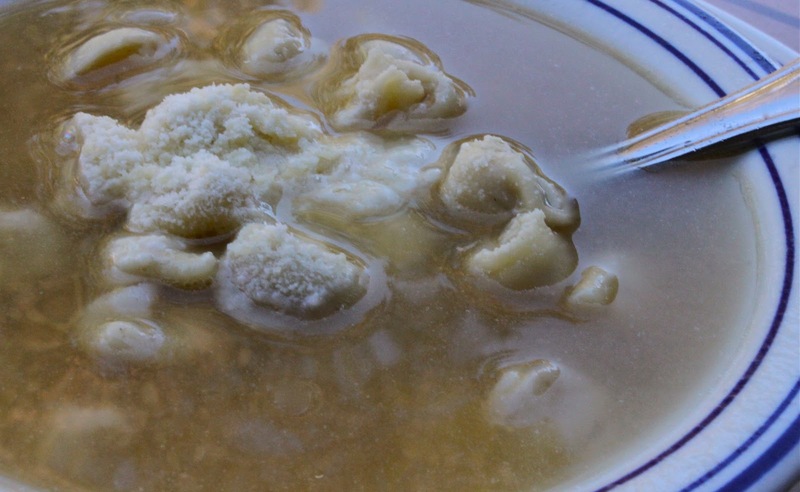 There is no set amount of time, this is how you determine if the tortellini are finished cooking: They will float to the top of the broth first, then you take a few out on a spoon and bite into them. If too hard for you, then cook for another 5 minutes, if soft, they are over-cooked, if they have that perfect ‘al dente’ medium bite, they are PERFECTLY COOKED. This takes practice. It is better to undercook pasta than to overcook it. The key is to constantly check on the ‘bite’ or the hardness to the tooth. Also remember that pasta continues to cook in hot broth when it is in a serving tureen or big bowl on the table or if left in the pot on the stove (as we do). If I can help you with this as you go along, please let me know. When is your presentation so I can try to be free from work if you need help? Thank you so much for the advice Roz. You’re welcome, Drew. Let me know how your presentation goes. I almost cried when I found this recipe–my grandmother always made these but the family called them invayse (sp?) and instead of veal I’m pretty sure it was chicken/chicken livers but I’m going to make yours because it will be such a surprise for my mother! Only other thing we always did was spoon a tablespoon of homemade marinara/gravy on top of each bowl. Thank you!!! Hi Jill, I know exactly what you mean when you said that you almost cried. There are such special and meaningful Italian recipes and foods that are near and dear to our hearts. Growing up with a nonna who lovingly made these little tortellini is something we will always cherish. Please reply when you can and let me know if you made my mother’s recipe and how they turned out. I’d love to know!